"As we continue to pioneer novel computing paradigms, understanding the characteristics and promise of their building blocks is essential," explains Andrew Kent, a physicist at New York University who led the research team. "Our findings reveal how one of these components act, which is the next step in helping realize their potential." The research, which appears in the journal Scientific Reports, also included scientists from the University of Barcelona and the Institute of Materials Science of Barcelona. Its lead authors were Jinting Hang, an NYU physics graduate student, and Christian Hahn, an NYU postdoctoral fellow who presently works at Physikalisch-Technische Bundesanstalt (PTB) in Germany. 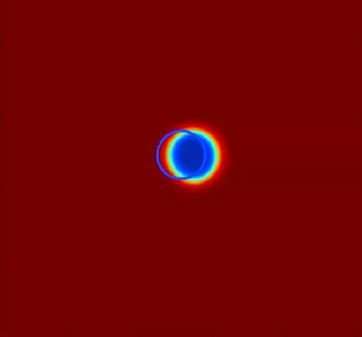 In their work, the researchers unearthed some of these droplet solitons' functionality—specifically, how far or long solitons can propagate without dissipating and how long they take to form. "This category of solitons may be important to the development of brain-inspired computing systems," explains Kent. "For example, they function as oscillators with a memory and thus mimic some characteristics of neurons."